Often after having experienced a very social Thanksgiving dinner (or not), I look forward to a quiet Christmas dinner. The menus for my Christmas dinner sometimes included ham baked with cloves and pineapples and a range of complimentary sides. Sometimes, my menus were very nontraditional, especially in the years I lived in Maryland. I would order cooked whole crabs and sides from the best little hole-in-the-wall crab house. We cracked open crabs, picked out the meat, ate greedily and drank wine until we were so stuffed, we passed out on the floor in front of the fireplace! Then there are times, I simply turned to a peppered roast of beef or lamb to star at my Christmas buffet. And so, this year a peppered lamb roast takes center stage surrounded by delicious sides. This Christmas dinner menu idea includes an appetizer tray. I find that the day of a holiday there so much activity going on that breakfast is served later, almost brunch time or even lunch is somehow missed. So rather than laboring to get either of these meals out, a bountiful appetizer tray or brunch tray can be more fun. It’s very informal, presenting a very colorful and flavorful choices meats, cheeses and fruits. 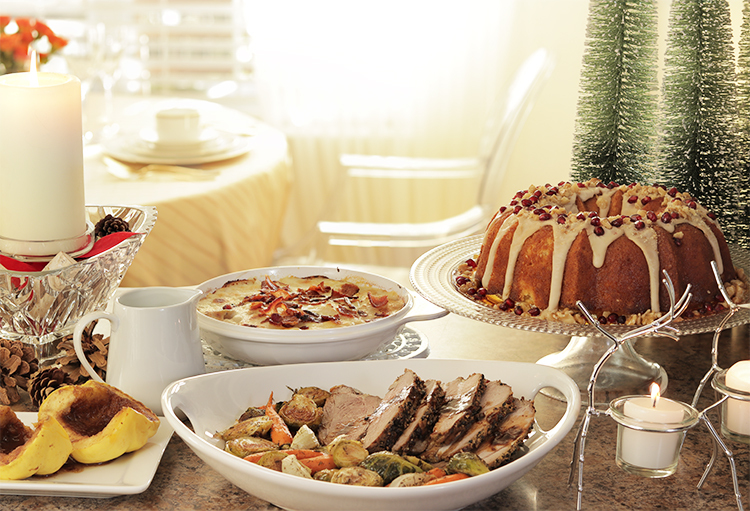 Set up the appetizer or brunch tray surrounded by Christmas decorations. Here, I found lovely artificial Christmas trees tipped in white, silver reindeers tea candle holders, and pine cones and small cut wood branches. Of course, a holiday dinner (or any dinner) must end with a palate refreshing dessert. This dinner ends with a complementary lemon cake and coffee.